There are many places where we felines should be. We belong on our human’s laps, for example. This is a place that Jacey, Marley, and I have all been on, and we purr when we are there. We also belong on the bed of our humans. Or the couch in our home. Jacey will tell you that she belongs on the balcony railing, but the human insists that she get off it because of high rise syndrome. But there is one place where we can all agree that cats do not belong. We do not belong on an interstate highway median. We certainly do not belong there if it is cold out and we are hurt. And that is why I am happy to share with you the story of how one of the humans with badges carried out a cat rescue. 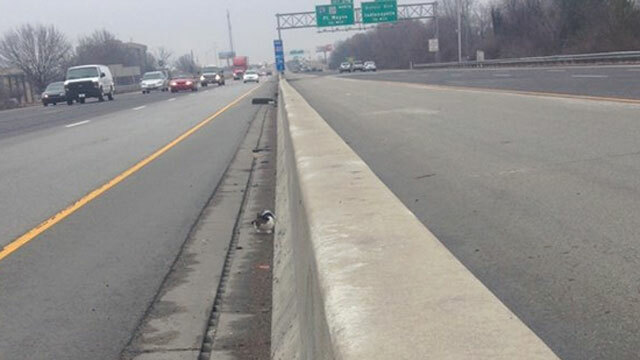 One of the humans with badges spotted a cat trapped, huddled against the barricade on the busy I-465 in Indianapolis. He decided that the cat needed to be rescued right away, but it required more than just his efforts to do this. In order to carry out the cat rescue, he contacted other humans with badges to slow down traffic. After he could safely approach the feline, he went to get the cat, and completed the initial phase of the cat rescue. Then he took the cat to the humans in white coats at the FACE Low Cost Spay/Neuter Clinic. Fortunately, the cat, who has since been named Plinko, was not badly injured. She was dehydrated and had some facial cuts due to the flying debris from the highway, but she is okay. Not surprisingly, Plinko is still scared after her cat rescue. But she is very gentle and loves to be pet. And FACE is trying to find a furever home for her. When she goes to that home, the only time she will have to worry about cars is when she is put in one to go to the humans in white coats. 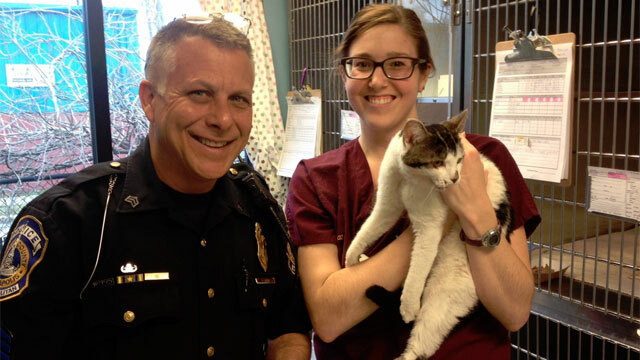 I am glad the humans with badges worked so hard to carry out this cat rescue!